How the director’s mastery of space and location created the famous crop-duster sequence. By any estimation, Alfred Hitchcock’s 1959 film North by Northwest is absurd. 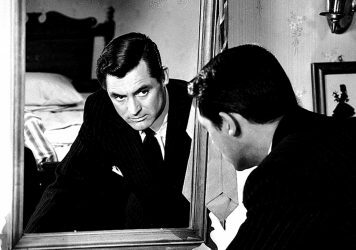 Its narrative is one of extreme coincidence and bad luck; its lead, Cary Grant, is just as confused about what is going on as the helpless character that he plays; and the film is stock full with visual innuendos, ending with perhaps the most ridiculous of a train, phallic-like, entering a tunnel. North by Northwest is essentially another variation on Hitchcock’s typical ‘wrong man’ narrative but, with the addition of a lavish dose of comedy, it can be read as a forerunner to the James Bond films and others of that ilk. 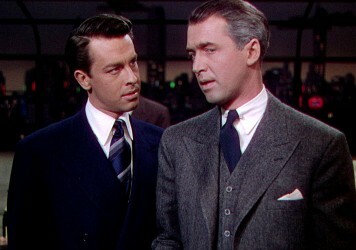 Advertising director Roger Thornhill (Grant) raises his hand at the wrong moment in a bar under surveillance by the henchmen of an information smuggler, Philip Vandamm (James Mason), mistaking Thornhill for an FBI agent called Kaplan who himself is merely a nonexistent decoy. Further being falsely accused of the assassination of a UN delegate, Thornhill is forced to flee via trains and buses across country in search of answers. He meets Eve (Eva Marie Saint), a seeming guardian angel who turns out to be a double agent, pretending to work for Vandamm but really helping the FBI discover his method of transporting secrets passed the Iron Curtain. The film is a chase to nowhere, a hunt for nobody that ensnares the wrong man again and again until he eventually fulfils the role of spy. Hitchcock knows that to get away with the joviality of the film, he needs the danger at the heart of the chase to be genuinely menacing, not simply another joke but something quiet and deadly serious. He achieves the culmination of this menace in one of the most analysed and discussed scenes in his filmography: the famous crop-duster sequence. The scene is some way into the film and is really the centrepiece in terms of attempts on Thornhill’s life. Still playing the part of Vandamm’s aid, Eve sends Thornhill on a bus to a deserted highway, supposedly to meet the elusive Kaplan. The scene marks a shift in tone; in fact it could be from another film entirely. It’s an exercise in tension as Thornhill is increasingly conspicuous on the empty road; a sharp-suited Grant sticking out like a sore thumb in the dusty rural landscape. The scene is essential in that, at least until this point, the danger has been treated as quietly comical even when its consequences have been serious. Grant is still screwballing as the knife flies into the back of the UN delegate and when he’s driving, forced-drunk, in order to avoid a cliff’s edge. An earlier scene of a lift full of people laughing at Thornhill’s mother asking if his would-be assassins want to kill her son summarises the film’s atmosphere in a microcosm. Yet something changes in the crop-duster scene. Truffaut comments on the editing length of this sequence, highlighting how unusual each shot length actually is. There’s an unusual patience to what becomes an incredibly slow portrayal of a fast sequence. We therefore feel every one of Thornhill’s paces fleeing from danger. The crop-duster plane in the distance isn’t the only aspect to fear. Once Hitchcock has spent several shots showing Thornhill’s vulnerability, everything becomes a potential menace; cars going past could signify Kaplan or worse. When a car, quite inexplicably, drives from behind a small patch of crop and drops off a man on the road’s other bus-stop, the scene is at its tensest. The framing is perfect with each man on the other side of the road separated by the silence between them. The landscape has turned something incredibly simple into something unnerving; the absurd is in the metropolis far and away from Thornhill’s current location. This is even before the actual attack has occurred. The man waiting for the bus has a final, eerie omen to share: that the plane is dusting where there are, in fact, no crops to dust. Thornhill doesn’t seem to be quite sure what is happening when the plane turns its attentions towards him and attacks. He still seems bemused as the plane dives the first two times even though it fires on him on the second run. By the third, Thornhill knows that this is more serious than the usual screwball reality of the film. His turning to camera with the stuttered movements of his body’s survival instinct kicking in is one of Hitchcock’s strongest moments. Grant’s performance is perfect in his change of running style. Throughout the film, his run has still been comedic, lanky, wide-eyed. Here it is an expression of bare-faced fear as he runs and takes brief cover in a crop. Soon, however, the absurdity will return. The plane will crash clumsily into a passing oil truck with a blast of Hermann’s music once again playing. Thornhill will drive off back into the absurdity of the metropolis, in a van with a fridge tied on the back, but, just for these few minutes, Hitchcock’s famous sense of menace crept back in. The isolated highway would never quite be the same again. Every plane, car and person was now a foe desiring your demise. Yet Hitchcock knew that this sense was down to the landscape, the presentation of the isolated road; and something to be taken advantage of again the following year when sketching another private trap, the highway of the Bates Motel no less. 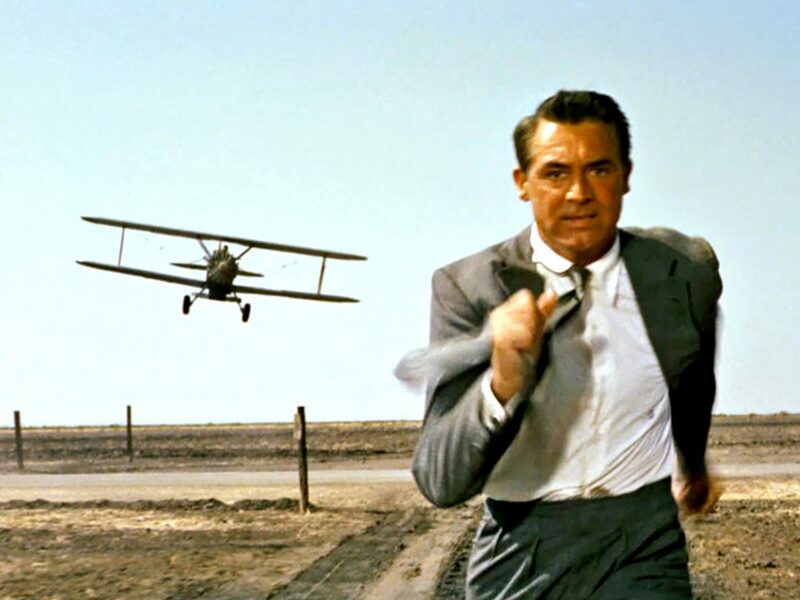 North by Northwest is re-released UK-wide on 20 October as part of BFI Thriller: Who Can You Trust?, which runs from Friday 20 October to Sunday 31 December at BFI Southbank, online on BFI Player and at selected UK venues. 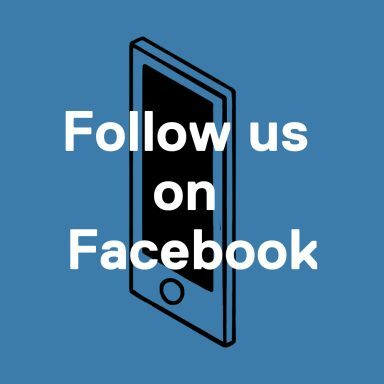 From finding his feat as touring acrobat to earning Hollywood leading man status, the story of this enduring icon is full of intrigue. The director’s classic “one shot” thriller introduced numerous new and innovative cinematic techniques. 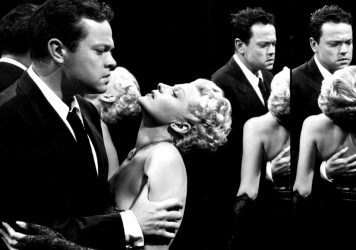 The Lady from Shanghai is a prime example of the legendary filmmaker’s complicated genius.